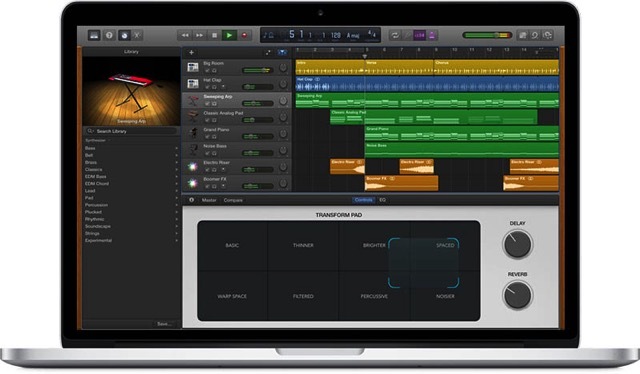 Alongside the launch of Apple Music on June 30, music creation software GarageBand for Mac will also be updated with new synths and features, as pointed out by Macworld’s Kirk McElhearn (via MacRumors). The forthcoming GarageBand update has been confirmed by Apple by issuing an update to the software’s official website, noting that it will receive new synth sounds, with significant improvements in its recording and editing features. “Capture your changes in real time by adjusting any of your software instruments’ Smart Controls while recording a performance,” reads a caption on the GarageBand website. “You can also fine?tune your music later in the Piano Roll Editor.” A footnote lists the new features as available on June 30 in the United States and as “coming soon” in other countries, consistent with the Apple Music website. Apple has demoed some of the new synths on the GarageBand website, including Sweeping Arp, Droplets, Bright Punchy Synth, Pumping Synth Waves and Epic Hook Synth. A total of 100 shape-shifting EDM? and Hip Hop?inspired synth sounds will be added to GarageBand, with each featuring the Transform Pad Smart Control for morphing and tweaking sounds to your personal liking. In addition to new synths, GarageBand’s software instrument Smart Controls and Piano Roll Editor will be improved in the update as well. The source speculates that Apple may also add a way for GarageBand users to upload new music to Apple Music Connect, a social platform which will be a part of Apple Music that will enable artists to connect with fans.